Procrastination is a funny thing isn't it? 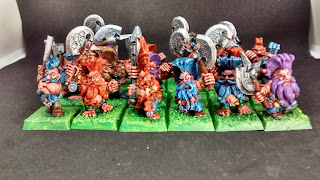 A few months back I decided to finally get round to painting the sizable unit of WFB4 era Dwarf Troll Slayers I acquired as one of my first major purchases when getting involved in the Oldhammer community a few years back. They were models that I remembered fondly from my teenage years reading White Dwarf, and I had always thought that if I ever embarked on a Dwarf army I would love to have a big unit of slayers with ALL THE CHAMPIONS!! The thing is once I started painting the rest I fell out of love with them pretty quickly and they then languished part painted on my table for a couple of months. Part of the problem was that I had lost my painting mojo while ill, but I had plenty of time sat at my desk when I could have been painting them, but instead I read hobby blogs, watched Critical Role, or occupied myself with on line groups and forums. Every time I looked at the Slayers half finished on the table I felt a pang of guilt, like my teenage self knowing I had homework to do but deciding to watch another episode of Star Trek: TNG instead. The other part of the problem was that I was finding them very fiddly as they were already based up and undercoated well when I bought them and I had decided to leave them as they were. 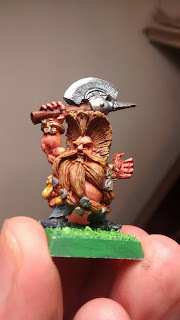 That made it a bit tricky getting underneath their ample Dwarven bellies, not to mention hair and beards so voluminous they would clog the workings of the cameras at a shoot for a Pantenne Pro V commercial. "And!" 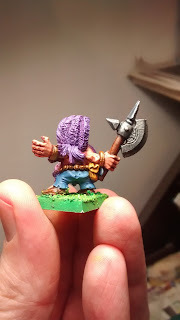 I thought to myself "it's the perfect motivation for me to get these bloody Slayers finished!" So I signed up with the promise of at least one Slayer, and the intention of having the whole lot finished by the end of August! Yeah.... Well... 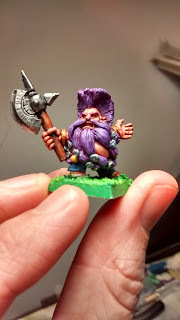 I did get one done, a purple haired champion no less, but even then I had to cajole myself along, spending more time planning for my Snotling project (i.e. playing with Snotlings and tiny mushrooms) than I should have done on painting. Was this a challenge as to how much you could procrastinate? If so, I was probably winning! So now September is here and Da Great Snot Off has begun! Much excite! What have I been up to you ask? Stripping snotlings of their old paint? * Prepping all those scenic bases with milliput and flock? 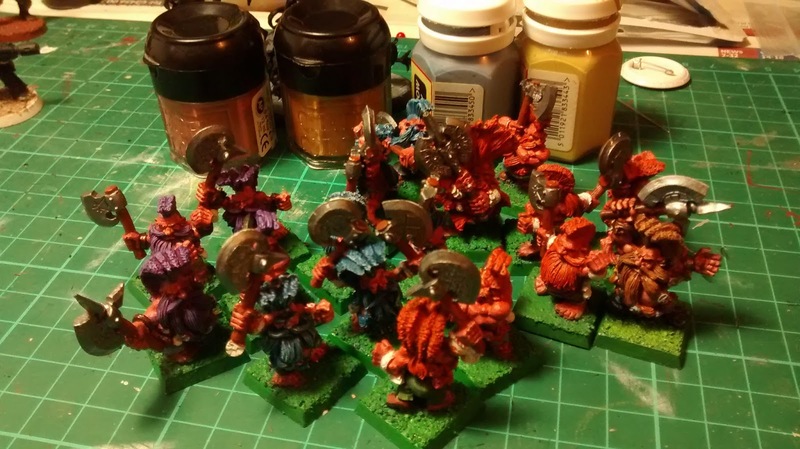 Undercoating the green tide? No. I have been procrastinating by painting Dwarf Slayers. The thing is, I have fallen back in love with them. 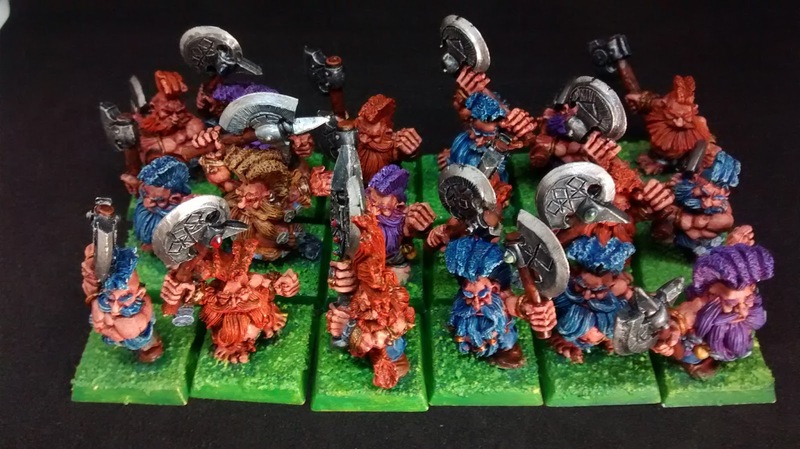 It happened when I applied the main flesh highlight to a whole batch of them and I could see the character come out of a range of the different sculpts all at once. 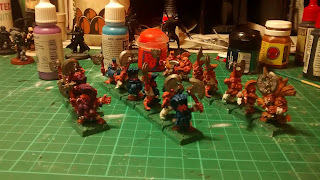 Now rather than treating them much as I would a unit of plastic infantry (as I had told myself I should in order to get the unit finished) I started to treat them more as individuals again, and that has definitely paid dividends. Sadly three days behind where I should be with my Snotlings, but I'm sure I'll catch up once I get down to it. Now, I really need to crack on with these Snotli... Ooh! Look! Squirrel!